No Child Goes Hungry (NCGH) is a registered 501(c)3 non-profit dedicated to the elimination of childhood hunger, one kid, one meal at a time. With funds donated by churches, private organizations and individuals, NCGH works with faith communities and other organizations to alleviate hunger on a local level. NCGH provides grant money as well as mentorship opportunities so that community organizations can build hunger advocacy programs that will thrive and grow as their communities continue to tackle the problem of local food insecurity. Currently, No Child Goes Hungry sponsors grants and works with community organizations in nine states and the District of Columbia. 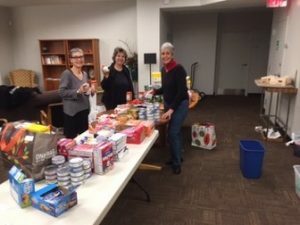 As NCGH grows, we hope to provide youth groups, scout troops, book clubs and other small bands of committed people the startup funds to host a food drive for a participating school or after school program. The options for making sure No Child Goes Hungry in our community are only limited by our imaginations! If your organization would like to become a future participant in this work, please contact us here.